Long service employees at UBC’s Okanagan campus were honoured Thursday. Pictured are: Gary Pearson, Robin Dods, Daniel Dural, Nancy Holmes, Rob Johnson, Bernard Momer and Ian Walker. Missing from the photo are: Briar Craig, Linda Hatt, Carl Hodge, Mark Holder, Patricia Tomic and Linda Falkingham. 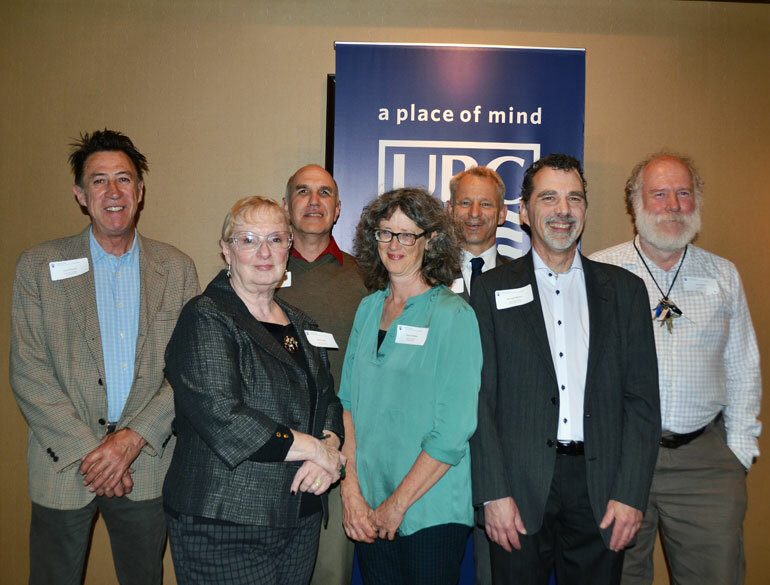 Different milestones were marked last week, as faculty and staff who have served for more than 25 years (at either UBC and at Okanagan College) were celebrated at the university’s Long Service Recognition Dinner. The annual event is an important way to honour long-serving faculty and employees who have helped shape the university, explained Deborah Buszard, deputy vice-chancellor and principal of UBC Okanagan. While talking about the transition from Okanagan University College to UBC and Okanagan College, Buszard said the two institutions currently provide more than 17,000 post-secondary positions. Along with music and top television shows and movies from both 1986 and 1991, significant news events, like the space shuttle Challenger tragedy and the gulf war five years later, were also part of the highlight reel.